There’s chatter regarding the recent announcement about the “FBI and FamilyTreeDNA.” Some of the chatter is accurate and some of is the result of headlines that are incomplete, misleading, or completely incorrect. 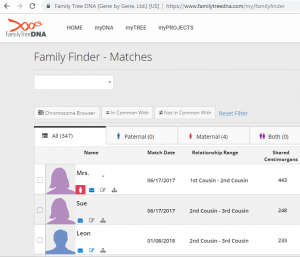 In the case of FamilyTreeDNA, without a valid court order, law enforcement will only be able to see information that is available to the standard FamilyTreeDNA user. 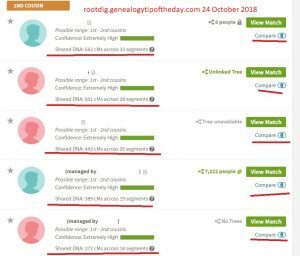 Some discussion of this FamilyTreeDNA announcement suggests that more data is being shared and that the FBI has access to the DNA of all submitters. As stated earlier, my take on the agreement (based upon the press release) is that the FBI can submit DNA samples and see the matches of that sample–just like I can submit a sample and see matches. This parallels how GedMatch has also been used by law enforcement. Is it possible that a second or third cousin of yours committed a crime? Certainly. Most of us do not know all the intimate details of all our second and third cousins lives. I’m not telling anyone what to do. We’re just sharing information. Informed users are better users. This entry was posted in Uncategorized and tagged familytreedna fbi. Bookmark the permalink. It was all legal, but unethical. Philip–thanks for your note. The change in the terms of service without notification is an issue and may change my total perspective on this.